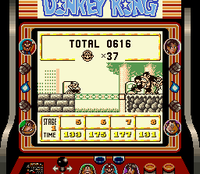 The Forest is the second world in the game Donkey Kong for the Game Boy. The world begins when Donkey Kong runs into the forest after being defeated in Big-City. The forest introduces switches and vertical ropes (from Donkey Kong Jr.) for the player to climb and water to swim in. The Forest has 12 stages.